I suppose it's no surprise to any of you, that I love to bake. I think I've said it often enough over the years. I just knew I had to participate. and finally got around to making them! (Oh you should see my folder of "recipes pulled from a magazine." They are easy to make, but a little bit time consuming. Cream Crisco & sugars together. Add milk. Beat in eggs one at a time; add vanilla. Combine flour, baking soda, cream of tartar & salt. Mix into creamed mixture. Chill 1 hour. Heat oven 350°. Roll out 1/3 of dough at a time, to ¼ inch thickness on a floured surface. Cut out with a 2¼ inch cookie cutter. Place 2 inches apart on ungreased baking sheet. Bake 5 to 6 minutes, until edges are slightly golden. Remove to cooling rack. For topping, combine caramels & milk in microwave safe bowl. Cover with waxed paper. Microwave at 50% for 1 minute. Stir, repeat until smooth. (Or you can melt on stovetop in small saucepan at very low heat.) Drop rounded teaspoonfuls on top of each cookie. Place 3 pecan halves around edge of caramel. Place chocolate chips in microwave safe bowl. Microwave at 50% for 1 minute. Stir, repeat until smooth. (Or again, you can melt on stovetop in small saucepan at very low heat.) 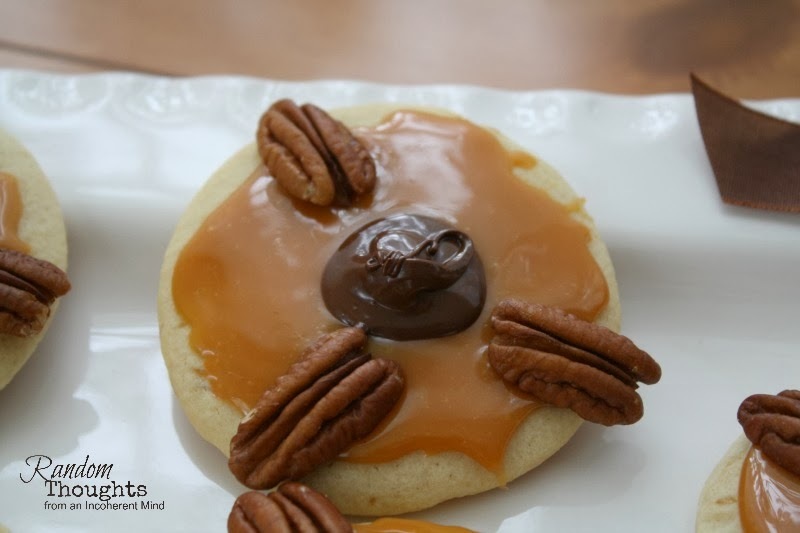 Spread rounded teaspoonfuls over top of caramel, but don't cover pecans. Cool completely. My goodness, those are some delicious looking cookies. I am so glad that you enjoy baking so much! I used to.. but, I've sorta gotten out of the habit, since we moved here a few years ago. I have piles of "ideas" I've pulled out of magazines too. I still save ideas, even with Pinterest~~ *grin**. Oh, Gina! These look a-mazing! I love turtles...the dessert kind...and these sound delicious! I hope you'll link them up to our All Things Thursday Blog Hop that's live right now. Have a wonderful week...and a blessed Thanksgiving! Now that is funny.... I just replied to another blogger in email about our love for turtles, opened your blog page and look! So I gotta pin these, it was meant to be. Uh-oh, here we go....cookie season. You usually post some real winners! I have got to take a week and curb my diet so I can fully enjoy all these lovely treats. Oh my these look amazing and I bet they taste just a s good. Those look delicious. I have a cookie exchange coming up so maybe I will make them. Yum! If only I could eat them I would. Those cookies do look yummy! I made your apple cake recipe last month and thought of you! My oldest daughter would absolutely love these, Gina. Thanks for sharing! Some cookies are worth the extra work! These look delicious and I'm sure taste as good as they look! 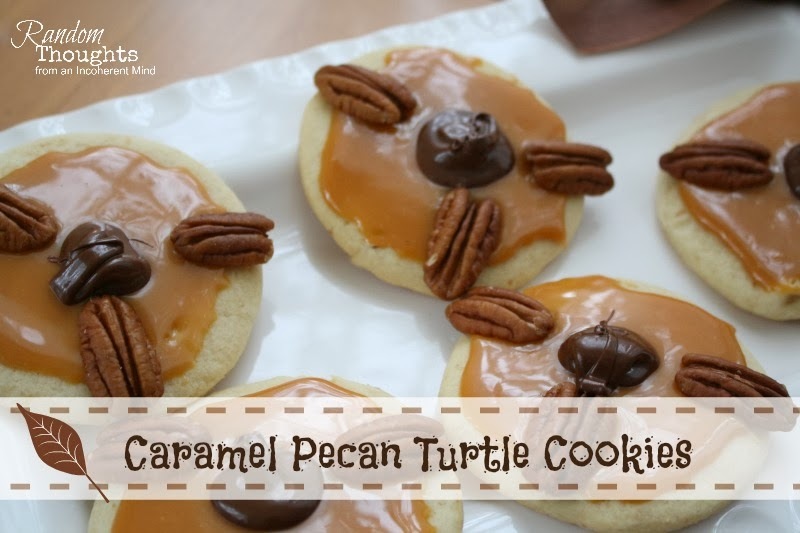 I love turtles as it is, but to combine them with a cookie....you are blowing my mind! : ) Yummy! WOW these look so good. Sorry I have not been around as much as I should be I see. I missed all this.